The story of the ACME factory. The Acme company started as a small backyard business by the brothers Warner but as Wile E Coyote. their first customer, purchased more “things”, desperately trying to catch that pesky roadrunner, the Acme company prospered and expanded to larger premises and that is how it arrived at its present size and location. Because of the large work load and the diverse range of goods that were required by Wile, but mainly because they wanted their very own little railway, the managers decided to install a 15” gauge railway to bring in raw materials, move them around the factory and ship out the finished products. To get workers from the outlaying areas to the factory they had purchased a couple of coach kits from Fcalv and after putting them together they decided that they really needed to sit on track a little wider than 15" so they mounted them on 22" bogies. This meant that the layout will be dual gauge with narrow gauge for the goods and broad gauge for the passengers. Well that's my story and I intend to stick to it. I wanted to have the effect of the buildings towering over the trains so I intend to have at least 3 stories on part of the building and a really tall chimney at the other end of the layout to act as some sort of a visual balance. The layout is the same size as my “Ladysmith Sidings”, 45" x 17", which means that I can use the same base........one less thing to make ! 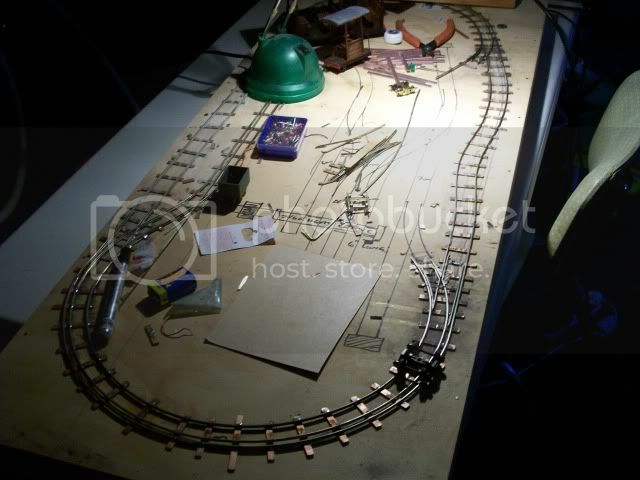 Because of the tight curves and the dual gauge track all the track will have to be hand laid. I am not very happy with this as it involves a couple of points which have no moving bits but which will separate the 16.5mm and 22mm tracks in the fiddle yard. And also a single point out the front which will switch the narrow gauge but not the broad gauge. 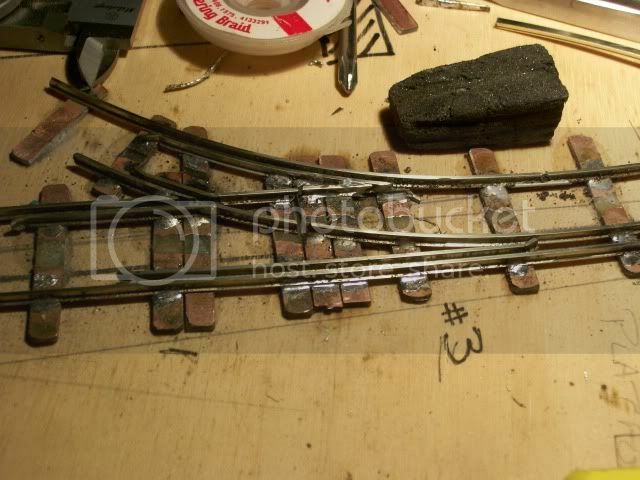 Although the outer loop is sort of set in stone (ie I have already layed most of that track ) the shunting area is still very much in a state of flux. Not sure if it is to be an “Inglenook” or “timesaver” style yet. The "Timesaver" style (option 1) has a greater number of points and allows the loco to change ends on the train which allows for greater flexability. The "Inglenook" style (option 2) has fewer points but means that the loco can only be at the right hand end of the train. Maybe some input from you guys might help ? I really admire people who can hand lay dual gauge and combine a point into it! 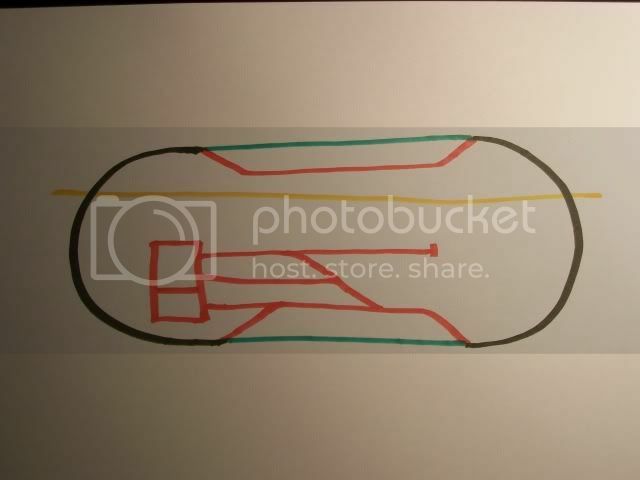 As to your track options; The black lines drawn on the board looks like it had a traverser across the end of the sidings. That would look cool. Must admit I hadn't thought of adding another point on the main line. 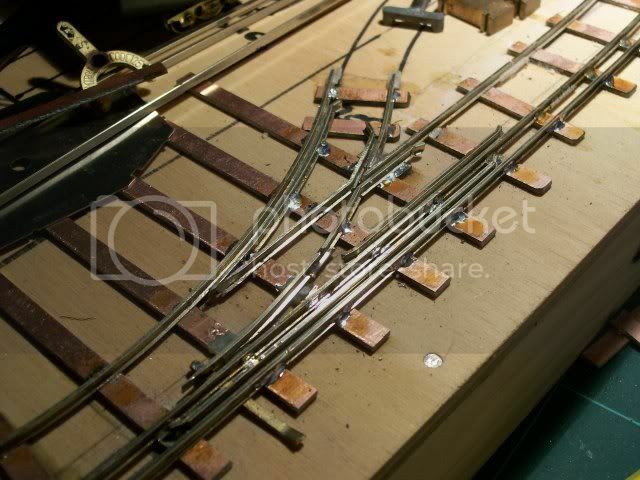 If you want dual gauge track at the radius that I want one has to hand lay it........Not too difficult if you take it slowly and have a number of gauges. Last edited by Adrian on Fri Apr 30, 2010 5:38 am, edited 1 time in total. Glen A wrote: I really admire people who can hand lay dual gauge and combine a point into it! ....you obviously didn't see my triple gauge turnout in S scale that was in my shed when you were last lurking Got an award at the '92 Convention. What's more, it was wired to run trains on all three gauges. I presume those trucks in the photos are HO, and S scales ? 22" gauge, I hear you say.... well, it does exist. ... and of course, the original line at the Homestake Mine at Lead SD (near Deadwood) was also 22" gauge. 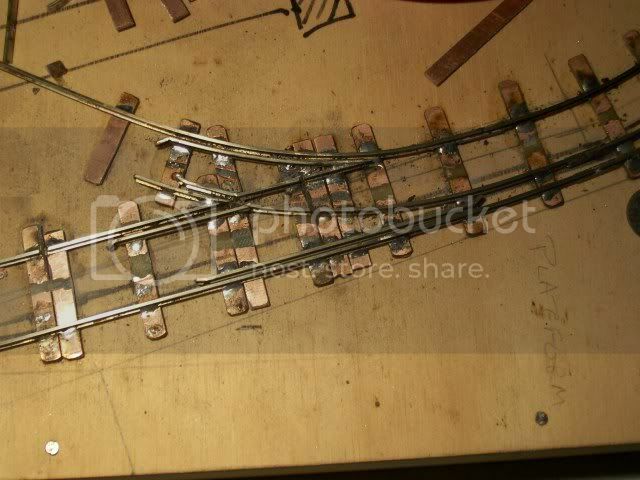 Regarding triple gauge turnouts.....I think that anybody who even decides to build such a beastee deserves an award. Adrian wrote: Regarding triple gauge turnouts.....I think that anybody who even decides to build such a beastee deserves an award. 22" was one of Cagney's catalogue gauges according to the information I have. It must have been fairly common in the US therefore. That looks like a nice orginal Cagney in the picture. chris krupa wrote: 22" was one of Cagney's catalogue gauges according to the information I have. It must have been fairly common in the US therefore. That looks like a nice orginal Cagney in the picture. It is. When I went to the Zoo, I noticed on the door prices 'train Ride', didn't pay too much attention, expecting some fairground attraction type gaudy diesel powered steam outline excuse for a train. It wasn't long before I heard the melodious steam whistle, and barking exhaust, that led me on safari to hunt down the beast, which at first sight, I identified as a Cagney. Just a quick update on the Acme layout. 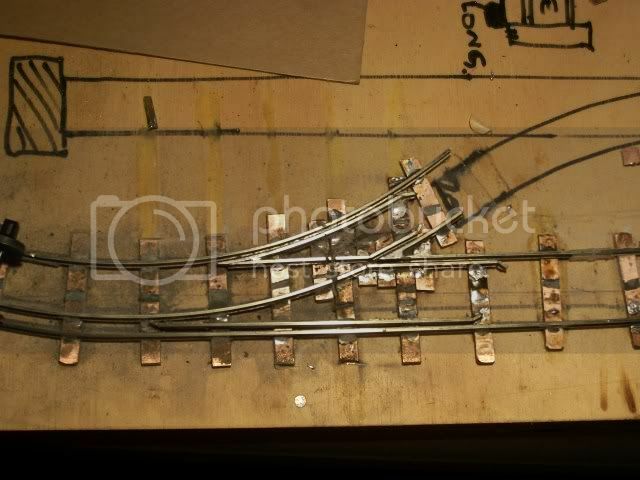 The green lines are 22mm track for passenger stock only. The yellow line i the factory/backdrop. The plan allows for the goods train to approach from either end and get off the main line, allowing uninterupted use of the main line by the passenger train. It will also have a traverser (thanks for the idea Glen ) on the left as this will avoid building at least two points......always a good thing....and save a little space. This means that no matter which way the goods train is travelling it will not have to reverse onto the mainline. Something that was worrying me on the original layout. The main loop is now done and is about to be wired and then tested. Well at least the 22mm gauge section. Well, back to the work bench and the wiring. How did you make 2 tracks in one peice of track?? Adrian the points look interesting, and I like the simplicity of not having any moving parts in them, I like the new plan as well. Michael obviously has a quicker eye that I do, but I've done sprung points before. Is this the same, in the in the first photo of the track, a train moving left to right will always go straight on, whereas a train approaching from top right will join the main line? Many years ago I tried to do that for a model of the Haytor Tramway, but failed. Am I close or is everyone else seeing something I'm gnot, which is more than likely? Jack.....If you look at the last picture you will see that the inside rail is common to both gauges.....the outer rails provide the 16.5mm and 22mm gauge rails.....therfore 3 rails do the work of 4. Andy A.......A closer look at the two point photos will show that the diverging track is the 16.5mm gauge while the straight track is the 22mm gauge.......this means that the gauge of the vehicle which determines which direction it will take. 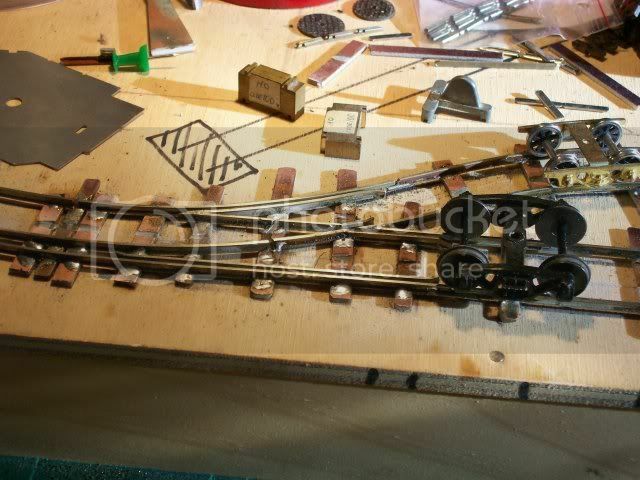 If it is 16.5mm gauge its running rail will force it to the diverging track. Oh now I see, thanks Adrian. Nice work on the track Adrian. It all looks deceptively easy when your neat work is magnified to that size. You might even temp a few to have a go. But you will not fool me so easy. I know how hard it is to get a point frog aligned correctly. Just wired up the track and after gapping ALL the sleepers (trains don't work too well with a dead short) I had my S gauge Black Beetle travelling on the main line. 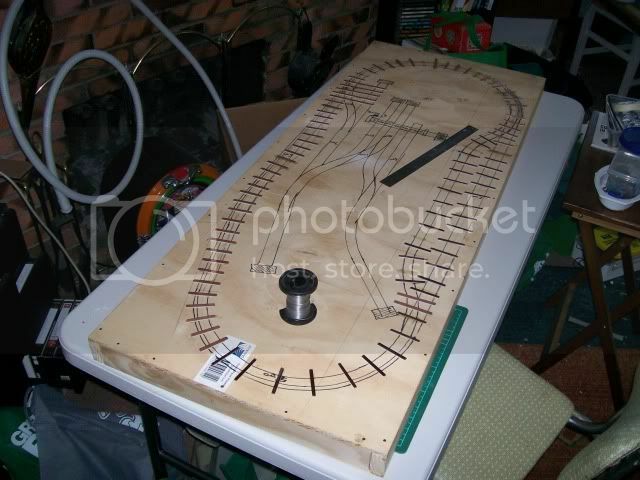 Will now have to build my own gauge and modify the offending lengths of track. Can you see any difference ? I know I can't and I did the modifications ! One other problem that reared its ugly head was when I tried running one of my 'Lolo' locos through the points was that it leaped around like a frog on steriods After a few false starts I discovered that the back to back wheel gauge on the 'Lolo' is actually smaller than the NMRA standard for HO (and of cours my track is close to the NMRA standards. I then tried out the Black Bettle which ran through the pointwork as if it was straight track. 'S' is the scale (1:64th) not a gauge. 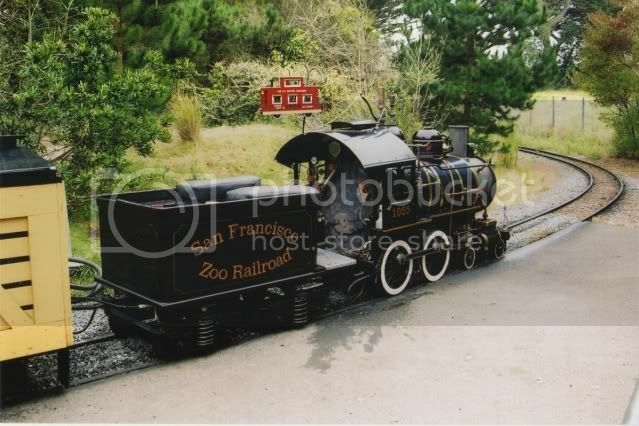 For instance S scale in New Zealand most commonly runs on 16.5mm gauge track to model 3 ft 6 inch gauge prototype. So the gauge can be what ever prototype gauge your modelling. http://www.s-scale.org.uk/history.htm states the gauge is 0.884 of an inch so that is 22.45 mm to model 4 ft 8 1/3 inch standard gauge. ...or you can use the NASG standard, which is 7/8" for Standard gauge, which is what I have a bit of.